Chevy Silverado headlights that have most likely never been used, these are dealership take of factory oem gm products. Buy them at 60% of dealership GM costs. If you are a body shop or Chevy 1500 Silverado owner needing one or more headlights, give us a call to our location outside of Dallas, Tx. 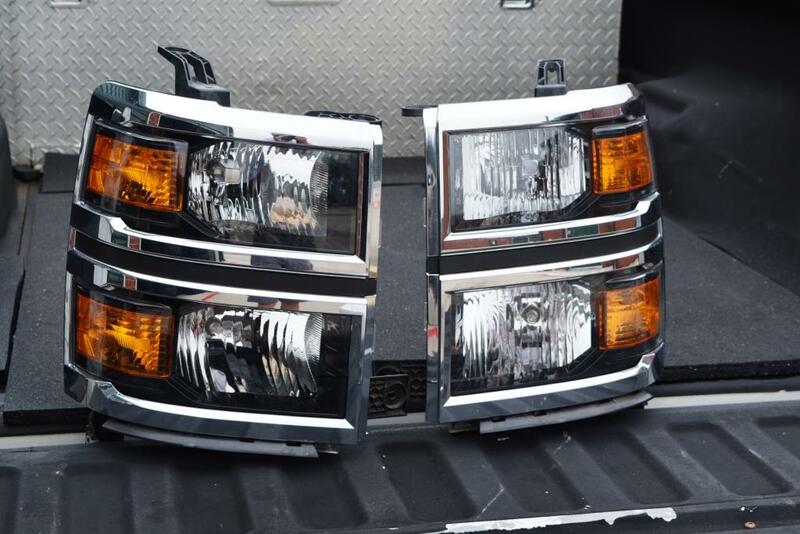 Price: $600 Set of two – left and right headlights $350 each. These are LT, not projector LED’s. Shipping costs are $45. Free pickup near our Oklahoma City location in Newcastle Oklahoma. These are great for body shops to replace 2014 and 2015 Chevy Silverado LT pickups with a Chevy Silverado Grill that is like new quality with just a few scratches or dings at a fraction of the dealership price.. Please use these lists as a guide and verify with your own independent sources if these chevy factory headlights will fit your Chevy Silverado vehicle before ordering. Please also check read our policies before ordering.